Lindsey Blevins, Red Lion, jr.
After finishing a stellar junior season with 264 kills, 201 digs and 32 aces, the outside hitter was named to the PVCA All-District 3 first team and helped lead the Lions to the district quarterfinals. Jordan Landis, York Suburban, sr.
Landis' stellar play led the Trojans to within a match of their first league title since 1977. Landis was almost always the best all-around player on the court as she finished with 235 kills, 265 digs and 35 aces, and she even threw in 20 blocks. Katie Laughman, Delone Catholic, sr. Highly regarded by opposing coaches as the top player in the league, Laughman kept Delone's high-powered offense clicking on all cylinders with her smart decisions from the setter spot. Laughman routinely racked up 30 to 40 assists a night, and she helped extend Delone's reign atop the YAIAA. Emily Poole, Central York, sr.
Poole proved to be the Panthers' most dominant hitter, racking up 264 kills. 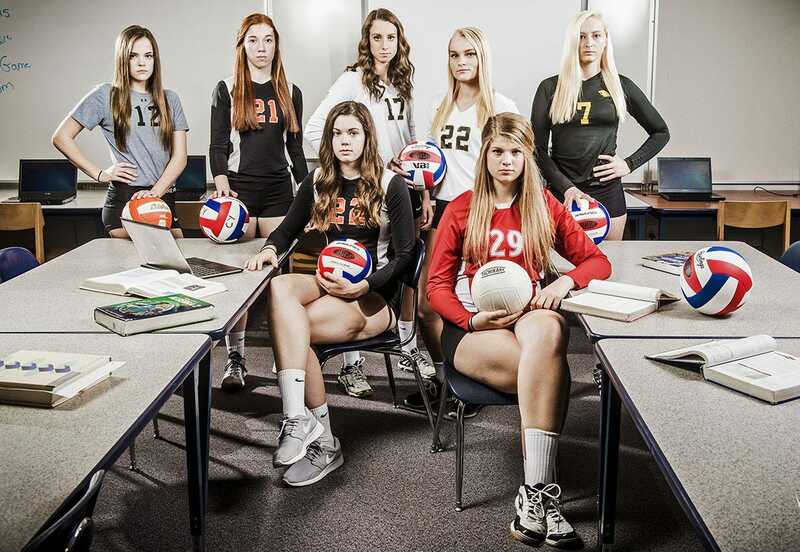 She and her setter, Emma Saxton, formed one of the league's best one-two duos. Under the guidance of head coach Nate Ocasio, Poole helped carry Central to new heights this season: a division title, a district finals appearance and a state playoff win. Emma Saxton, Central York, jr. Along with Poole and a cast of talented Panthers, Saxton's ability to set up her teammates helped lead Central to its first district championship appearance since 1984 and on to the PIAA quarterfinals. Saxton finished with 627 assists, 148 digs and 25 aces. Sarah Senft, Delone Catholic, sr.
After the Squirettes lost three starters to graduation, Senft — a second-time first-teamer — stepped into a greater leadership role and led Delone to a fourth straight league title. The Squirettes were ousted in the district finals and state quarterfinals, but Senft put together one of the more impressive careers in recent memory. Mady Whitcomb, Bermudian Springs, sr.
What a monumental season it was for the Eagles senior. Whitcomb broke the school's all-time career kills and blocks records midway through the season to secure her spot among the best to ever play at Bermudian. Central York: Hannah Rishel. Hanover: Saranda Gerlach. Red Lion: Lauren Enfield. South Western: Hannah McMaster and Tori Sager. Spring Grove: Laken Bankert and Autumn Leese. West York: Amanda Sides. York Catholic: Brooke Ricks. Ocasio has quietly turned the Panthers into a powerhouse over the last few seasons. In 2015, Central won a division title, reached the district finals for the first time since 1984 and secured a state playoff victory.